Last week the Austin City Council voted for the sound walls that had been approved by neighbors that live adjacent to where the walls will be constructed. The vote was 6-0 with council member Mike Martinez off the dais. The city council vote was the next step in the process before any work could get starte on construction of the walls. It is also one piece of the MoPac Improvement Project plan being developed to relieve congestion along MoPac from Parmer Lane to Cesar Chavez. There are two sound walls of particular interest to Allandale residents. Sound Wall #2, along Great Northern between Pinecrest Drive and Foster Lane was voted down by the adjacent property owners. The adjacent property owners voted for Sound Wall #3 that would run along Great Northern from the Far West Pedestrian Bridge south to 2222. The sound walls are part of the environmental assessment piece of the MoPac Improvement project which is now under review by the Federal Highway Administration (FHWA). City Council's approval of the sound walls was necessary because the walls would be constructed in the City's right-of-way. If FHWA agrees with the MoPac Improvement Project team's recommended plan for addressing congestion along this section of MoPac and approves the enviornmental assessement which includes the sound walls, they will be presented at a public hearing in the Spring. The feedback from the public hearing will be factored into the overall decision on whether to move forward with construction of the project. Click here for more information about the MoPac Improvement Project. 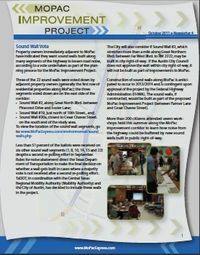 If the project moves forward, construction of the sound walls would be constructed in 2013/201.